Janelle generously brings her love of riding bikes, excellent teaching skills, and Spanish language fluency to be a part of our newest work with our partner communities – community-led rides. As we identified a need to support our partner communities in learning and teaching their neighbors about bikes, Janelle was there at a moment’s notice, offering assistance in a Ride Support role for the ABC bike committee summer ride series at Hacienda CDC. When asked to take a lead role for Holiday Bike Drive, she went above and beyond to provide much-needed Spanish interpretation support for kids and adults, helping us create a more inclusive and welcoming event for our neighbors and future riders! And all this is done between her busy hiking, biking, and frequent Portland hang-time schedule. Pretty amazing. Learn more about Janelle in this month’s Volunteer Spotlight. Why do you volunteer here? How did you start? I volunteer with the Community Cycling Center because I want to encourage others to develop a healthy relationship early on with a powerful tool of independence and fun. I started at the Cycling Center through the influence of some other friends who were involved in Tuesday Drop-In Nights and Holiday Bike Drive. What sort of volunteer work do you do? I started out volunteering on Tuesday nights. I enjoyed learning the ins and outs of some simple bike maintenance. I learned of other great community outreach programs the Cycling Center sponsors and developed interest in interacting directly with the community on a bike. I am able to tap into two of my favorite things: bikes and the Spanish language. I get to use my language skills and ride bikes with the Hacienda program, as well as interpreting at the Holiday Bike Drive. What is your most memorable moment in your time volunteering with us? 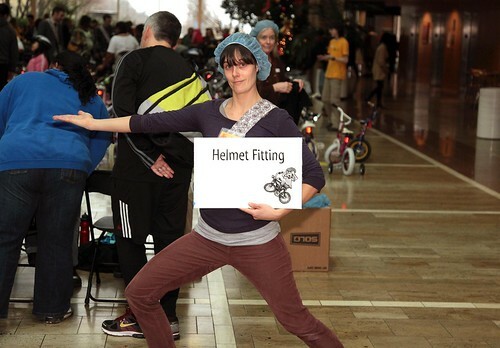 My most memorable moment was at the Holiday Bike Drive last year. I was helping a little boy find a bike that he wanted. His mom was pretty upset that he did not want a bike she wanted him to have. He told me his mom was mad and I agreed. I asked him if he loved his bike and he said with the brightest face, “Yeaaaah!” His excitement was all that mattered! What is your favorite Community Cycling Center program? Why? There are so many wonderful programs, why choose just one to be my favorite? The Holiday Bike Drive is a pretty magical day and always makes such an impression on me in the spirit of the December season. I always dream of having a tandem. Riding to a friend’s house and picking them up for some type of Portland adventure. Folks even race them in Cyclocross. Realistically, I’d love a full suspension mountain bike to collect some local mud! What do you like to do when you’re not here? When I am not at the Community Cycling Center I am a speech therapist. I also spend much of my time with friends who are also volunteers with the Cycling Center. I am grateful to have a Portland community of people filled with kindness and a love for adventure and bikes. What would your bio-pic be called? Who would play you? I think my bio-pic would be called “One Wild Oat” after an old Audrey Hepburn movie, mainly for the title. The storyline would take shape quite differently and probably just involve adventures in tiny chairs, on bikes, and in the woods. If I could combine Audrey and Zooey Deschanel for a mixture of playfulness, sarcasm, grace, and a no-nonsense attitude, that is who I would choose to play me.